There’s a new show in Animal Kingdom and we’re wild for it! Senior Wilderness Explorer Russell and his furry pal Dug from Disney•Pixar’s animated hit film UP join bird experts on a new adventure featuring encounters with birds from around the world. UP! 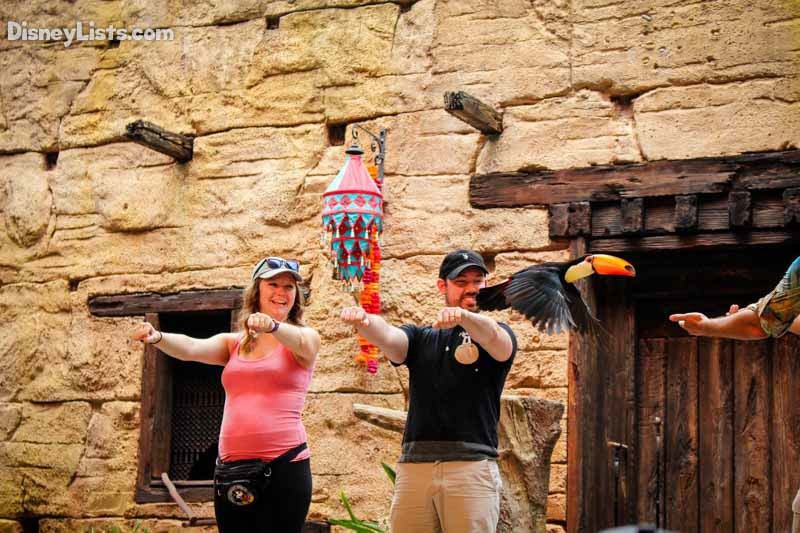 A Great Bird Adventure made its onstage debut at Disney’s Animal Kingdom on Earth Day, April 22, coinciding with the theme park’s 20th anniversary. We were there and really enjoyed the updated show. Keep reading to learn everything you need to know about this new show. Flights of Wonder, the original show in this space, was an opening day attraction in 1998. While the show went through many changes over the years, it always focused on various species of birds from around the world. The new show carries that tradition forward. The production team’s goal is to showcase beloved Disney characters and the amazing natural behavior of birds to inspire guests to connect with nature. Senior Wilderness Explorer Anika leads the show and is joined by Russel and Dug from Disney•Pixar’s UP. 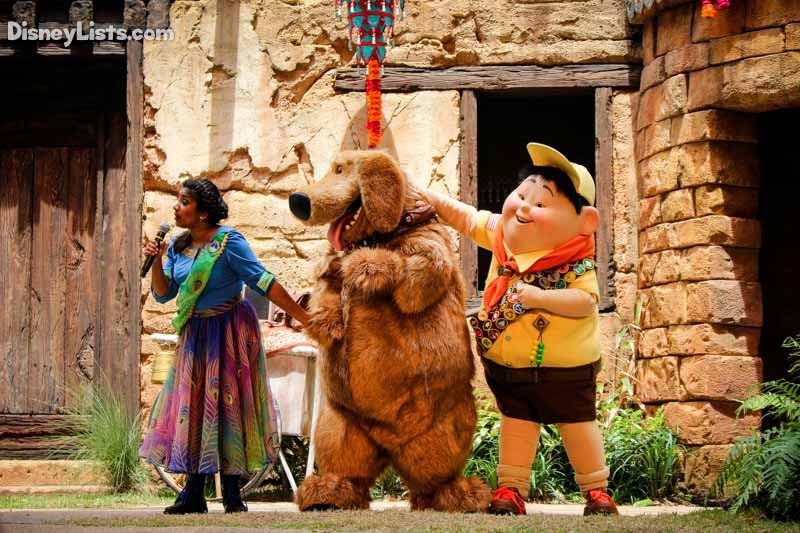 This is the first time that Russell and Dug appear onstage at Disney’s Animal Kingdom. (You can catch them at a character meet and greet and the front of the park near the “It’s Tough to be a Bug” show). An original, authentic Indian musical score features themes from Disney•Pixar’s UP. Russel and Dug bring questions about the birds and a lot of humor to the show. Russel mentions Kevin, the bird from the UP movie, in the stage show. Children will best enjoy this show if they have seen the movie and are familiar with the characters ahead of time. The stage looks like the Himalayan highlands or the areas around Rajasthan, India. The architecture for the buildings on the stage are from these areas and perfectly tie into the Asia area of the park as well as the native home of a few of the beautiful exotic birds that are featured during the show. The birds have spent hours and hours training with professionals. In fact, twenty animal trainers were involved in the training and rehearsal that brought the show to the stage. Four trainers work with the birds and the actors during every performance. The host for the show is a professional trainer who has spent a ton of time working with these beautiful creatures. The birds are trained to react and take different actions based on audio and visual cues they have been taught. Certain noises or words spark an action from the birds. Also, watch the trainer’s hand signals and hand placement as those are the visual cues for the action they want the birds to take during the show. It is impressive how smart these creatures are and what they have learned to do. Led by avian enthusiasts and bird experts, this unique experience features a close-up look at bird species from South America, North America, India, Africa, and other locations around the globe. More than 15 species of birds make appearances, including toucans, parrots, macaws, and an African fish eagle with a magnificent 7-foot wingspan. This may sound scary, but it is extremely awesome. These birds are well trained and fly exactly where they are supposed to. When they fly overhead you are able to get amazing views of their wingspan. You are also able to see what they look like in flight. It is always impressive to me how little they have to flap their wings compared to what I would expect as they swoop over the audience. It also can add for some interesting drama. During our show, a lady in the audience experiences an unfortunate dropping during the show and needed to clean up! Showtimes: Varies but typically runs at 10:30, 12:00, 1:30, 3:30 and 5:00. Always check the park times guide of the My Disney Experience App for the official times for the day you are attending. FastPass: FastPasses are available for the show. If you want a guaranteed seat up close, then you may want to use a FastPass for this. However, a FastPass would likely be better used for a different attraction. Just be sure to line up early to see the show. Age of Interest: All ages! Everyone will get enjoyment out of this show and be amazed! Wheelchair Access: The theater is wheelchair accessible and guests won’t have to transfer from their chair if they don’t want to. Location: Asia within Disney’s Animal Kingdom. To the left right after entering Asia from Discovery Island. Overall the addition of Russel and Dug add a lot to the show. 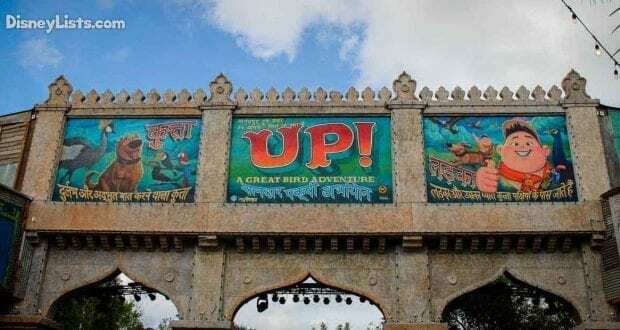 While there were a few problems during our show, such as a mic not working and birds not exactly following the script, we thoroughly enjoyed it and recommend adding this show to your time at Disney’s Animal Kingdom. Check out the live video from the opening show on April 22 on our Facebook page by clicking here. DisneyLists author Christy Caby also contributed to this article.